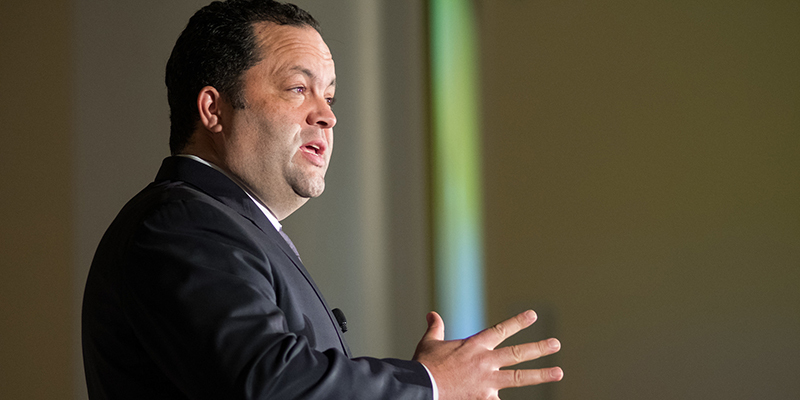 As this year’s Martin Luther King Jr. Week keynote speaker, former president and CEO of the NAACP Benjamin Jealous implored students at the University of Vermont to dig deep and find the issue they were born to fix. “Today I want to take a moment to talk to each of you about the urgent need for each of us to figure out that one thing that we're going to change about the world before we die…The two most important days of your life are the day you’re born and the day you find out why,” he said, quoting Mark Twain. 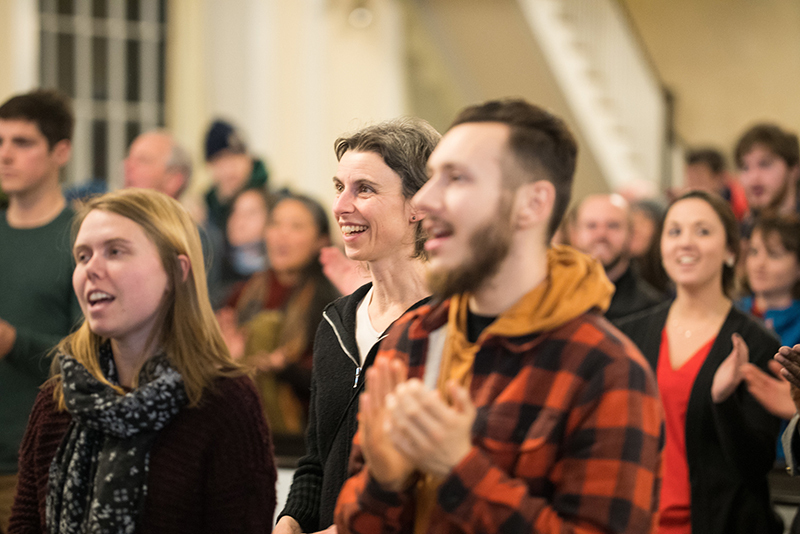 Jealous, the youngest person in the NAACP’s history to hold the post as president and CEO, spoke in Ira Allen Chapel on January 22 as part of UVM’s annual MLK Week. He is a renowned activist, civil rights leader, humanitarian, community organizer and was the Democratic candidate for Maryland’s gubernatorial race in 2018. Today he is affiliated with venture capital firm Kapor Capital. Jealous spoke candidly about his own experience prior to leading the NAACP, about the moment he realized he had a calling. It was a time in college when a group of his friends, predominantly men of color, raised glasses and toasted to black men who have lived to see the age 21, who have not landed in prison or been shot dead. “The notion that somebody thought it was an accomplishment for a member of any group — in this, the world's wealthiest democracy — let alone my own group, to simply breathe past their 21st birthday cut me like a knife. I couldn't sleep for days,” he recalls. Jealous detailed for the audience how, from there, he went on to narrow down his calling to one issue to tackle in his lifetime: ending the injustices in our justice system. He wrote that goal on a sheet of paper, which, he admitted to the audience, he taped to the bottom of his underwear drawer as a daily reminder of what he was working toward. 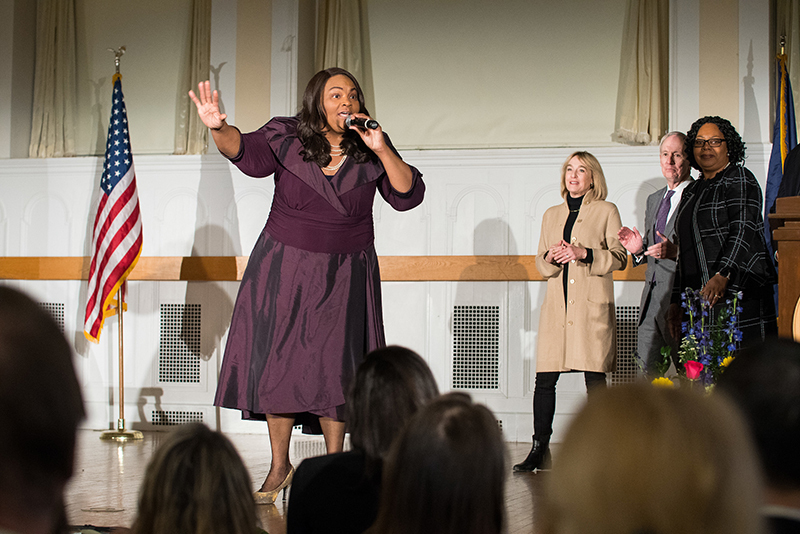 Throughout the evening, Jealous shared the podium with Wanda Heading-Grant, vice president for Human Resources and Diversity of Multicultural Affairs; Thomas Sullivan, president of UVM; and gospel recording artist Angela “Missy” Billups, above, all of whom touched on the importance of the Rev. Martin Luther King Jr.’s teachings. “While our civil rights movement in this country is now over 50 years old, there is still much justice and much progress to be made. As educators, students and citizens of our country, it is our responsibility to advance his aspirations for social justice and economic justice and dignity for every individual,” said President Sullivan.